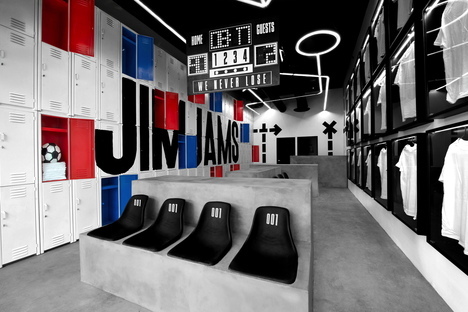 Mexican creative studio, Anagrama has designed both the branding and the actual shop for the JimJams sportswear brand, where the interior design plays with elements of design closely connected to the world of sport - lockers and stadium seats. Setting up a consistent relationship between branding - a rather abstract concept - and the physical store where the brand is sold is the latest challenge taken up by the Mexican creative studio, Anagrama. They've been working for years in the world of design and branding, but this time they partnered with the Mexican brand, JimJams that makes clothes for sports lovers. The logo and packaging are a direct nod to football, with the scoreboard and a decorative graphic design that picks up on the game formations made by coaches to explain a new tactic. The point of sales itself in San Pedro, Nueva Leon, also clearly references the world of sport but in the broader sense. Anagrama opted to organise the products in one of the recurring elements in almost all sports - lockers - where athletes store their gear. Here, there are so many they completely cover one of the long walls in the store. The logo is printed across the white outers in giant letters and the interiors of the lockers are painted blue and red to brighten up the environment. The wall facing the lockers contains glass display cases, where JimJams garments are displayed like team trophies and the black fixed seats on bare concrete bases look like they've been lifts directly from the stadiums. The references used skilfully by Anagrama and prepared as graphic connotations of the brand are also extended to the ceiling, where a custom-designed tubular light fixture traces the pre-match tactical drawings. With JimJams, San Pedro now has a very special-looking store with a post-industrial feel, underscored by the bare concrete, the black ceiling with exposed services which, thanks to the abstract approach used by the designers, highlights an almost austere minimalism. Additional proof of the great creative sensitivity of Anagrama in interpreting what the clients want and that gets across the brand message, from the logo to the creation of dedicated spaces.